The Ensoniq DP/2 creates 24-bit digital effects using two independent processors, and features two independent inputs and outputs with full internal mixing capabilities and discrete stereo processing. The Ensoniq DP/2 is equally at home in a professional recording studio, home studio, guitar rig, MIDI setup, or PA system. The Ensoniq DP/2 Parallel Effects Processor has over 60 high-fidelity fully programmable digital effect algorithms. Reverb, chorusing, ﬂang-ing, delay, distortion, pitch shifting and an assortment of other effects are provided with dynamic control over most of the settings. There are 600 effect presets: 300 permanent in ROM (Read Only Memory) and 300 additional presets in RAM (Random Access Memory) for you to edit or store your own creations. The Ensoniq DP/2’s two-in, two-out design permits stereo processing of two parallel channels (multi-processing). There is only one user interface, but up to two different input signals can each go to a separate internal signal processor. Independently configurable inputs and outputs also allow for special types of effects, like keyed expansion and ducking. The Ensoniq DP/2 can be used as one big effects box, or two separate effects boxes. The routing between the two processing units is programmable, allowing for a serial or parallel combination of effects. 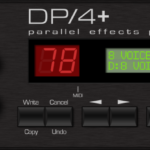 The DP/2 also offers paths to feedback the signal, and side-chain capability. The variable architecture and rich assortment of algorithms provides for unusual effect structures not found in ﬁxed routing systems. The Ensoniq DP/2 is equipped with an advanced digital signal processing system based on the Ensoniq Signal Processor (ESP) chip. The ESP chip is designed specifically for digital audio signal processing, and in the DP/2, two ESP chips work in conjunction with 16-bit analog-to-digital and digital-to-analog converters to provide a studio-quality output signal. 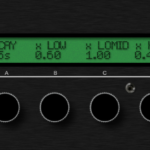 The digital effects processing capability has been designed to complement any input source (balanced/unbalanced; +4dBu to-10dBV), and all of the algorithms (except the Guitar Tuner) can have specific parameters modulated by various MIDI and non-MIDI controllers such as a keyboard’s pitch wheel, or the local CV Pedal.